What does Disney’s acquisition of Lucasfilm Ltd. mean? It means a new trilogy of the iconic but worn out STAR WARS films and relentless marketing of the brand. The trend for major Hollywood film studios these days is to produce very few original films and instead, spend more time and money on financing and developing outside films, then marketing and merchandising the hell out of them. 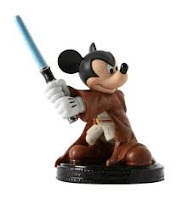 By buying up creative companies like MARVEL, PIXAR and now LUCASFILM, which includes such stars of the movie business as Skywalker Ranch, ILM visual effects and ILM animation (producer of the Oscar-winner RANGO), the Walt Disney Company seems to be following this trend and has dropped all but a pretense of creativity to do what they do best: merchandising and marketing. The Disney Company is the only movie studio in Hollywood not owned by some giant corporation because it IS a giant corporation, with a very long list of assets, including a publisher (Hyperion), hotels and the Disney Cruise Line. Popular opinion seems to be that nothing good will come out of this merger. This is a shame when you think of all the genuinely creative and innovative (mainly animated) films made by Walt Disney himself, who won twenty-six Academy Awards and seven Emmy Awards, giving him more awards and nominations than anybody else. He was also a marketing innovator but these awards were for invention, creativity and risk-taking in film, not for marketing, yet it’s the marketing that endures. The company’s concentration on profit has snuffed out almost all creativity. Many talented, enthusiastic artists and film makers fled Disney for more creative studios like Pixar and ILM and now find themselves right back where they started. But understanding that Disney isn't really trying to be creative is somehow reassuring, suggesting that they could still do it if they wanted to.